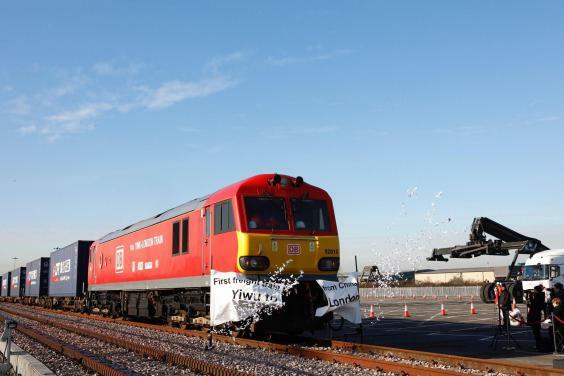 The first ever direct freight train from China to the UK has arrived to a fanfare in Barking, east London. The train, carrying millions of pounds worth of socks, cloth, bags, and household goods, set off from the manufacturing city of Yiwu. It has travelled more than 7,500 miles across seven countries and through the Channel Tunnel to reach London – where a crowd of politicians, journalists and excited residents greeted it. There were also people dressed up as two colourful Chinese dragons entertaining the crowds before the train arrived just after 1pm. The train was operated by InterRail Group, a multinational transport operator based in Switzerland, on behalf of China Railway subsidiary CRIMT. The journey was 7,546 miles, with DB responsible for the train from Duisburg (Germany) to Barking, running via the Channel Tunnel and High Speed 1. It started at Yiwu in the eastern Chinese province of Zhejiang, and took 18 days to reach London - twice as fast as a ship. DB said the train was loaded primarily with textiles and other consumer goods. Leader of Barking and Dagenham Council, Cllr Darren Rodwell said: “This is great news for the borough and London. The new weekly service is thought to be quicker than a container ship and half the price of air freight. 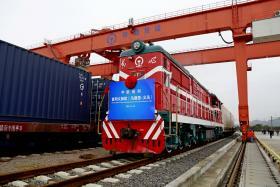 London is the 15th European city to be served by freight trains from China. The 34-carriage train reportedly contains £4 million of commodities coming directly from the factory floors of Yiwu, where over 60 per cent of the world’s Christmas goods are made or sold. The eastern city is the source of countless items in most British homes. Differing rail gauges in different countries means no single train can travel the whole route and the containers have to be reloaded at various stages. The Chinese locomotive is named after a famous quote from the communist revolutionary leader Mao Zedong: “The east wind will prevail over the west wind.